Hey guys! 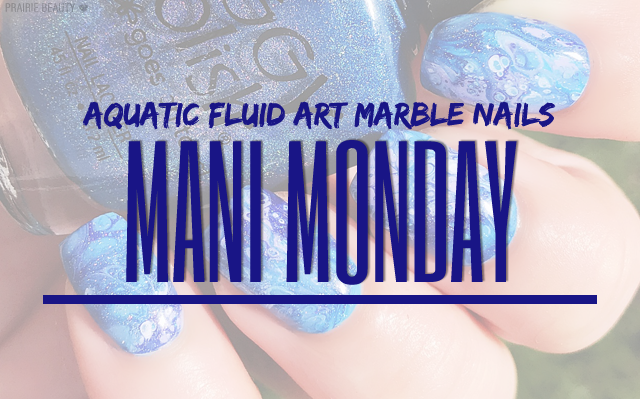 I'm ridiculously excited for this week's Mani Monday, because it might be my favorite nail art that I've ever done and it's also the most complimented. I actually did these nails on Saturday and since then I've gotten compliments from multiple strangers who've noticed them and asked me where I get my nails done! That always feels really good. To take a closer look at this mani and for step by step instructions of how I did it, keep reading! I've teamed up with Jayne and Renee again for our weekly #CBBxManiMonday and this week's theme was "Aquatic" - which I think could be taken a lot of different ways. 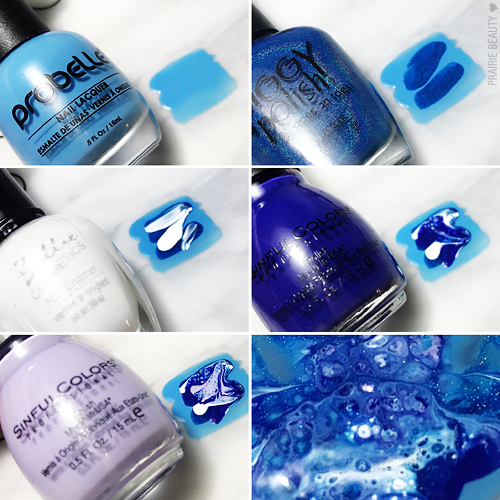 Initially, I had something else entirely in mind, but when I started looking through my polish collection to find the right blue shades, I caught sight of the Sinful Colors Hypnotic Transforming Top Coats and the whole plan changed on a dime. 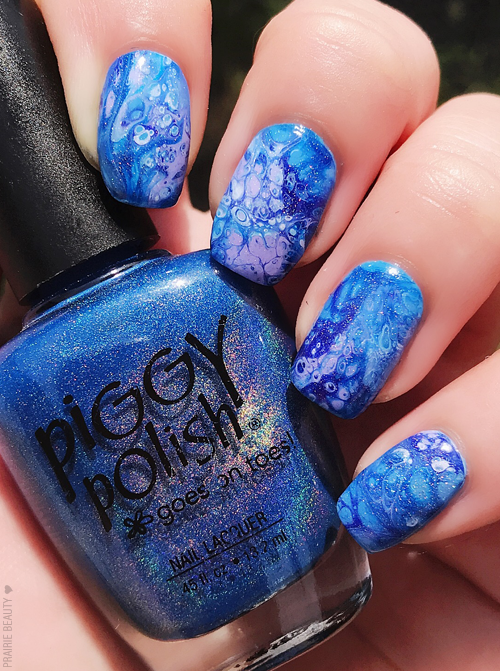 If you're unfamiliar with these top coats, essentially what they do is create cells in the polish that creates a look similar to fluid art. Unfortunately, the Sinful Colors Hypnotic Transforming Top Coats were limited edition - though you might still find a few bottles lurking in stores locally if you're lucky - but there are similar products that you can order online. They really are such an interesting look that I recommend trying it out if you're interested! For this look, I wanted to create the look of swirling water so I chose the shades I would use carefully. 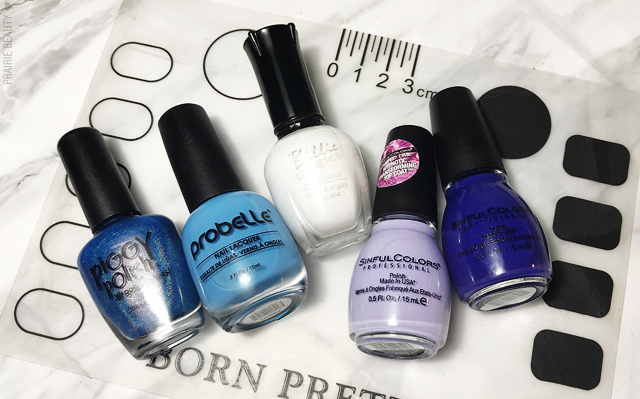 I started with Probelle Nail Lacquer in Into The Blue, which is a sky blue créme polish. Next I went for Piggy Polish in Vincents Stars, which is a gorgeous blue that my brain only allows me to describe as TARDIS blue, with linear holo through it. Because I think that a fluid nail art look always needs white as an anchor - and because it fits my colour scheme - I used Billie Nail Polish in French White, which is a ridiculously pigmented white that's available from Dollar Tree. 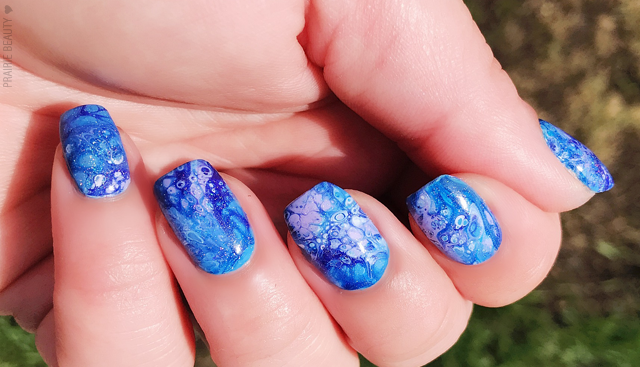 When I use the Sinful Colors Hypnotic Transforming Top Coats, I always like to use two because I think it makes everything cell up a little more interestingly. For this mani, I went with Purpunk, which is a pale lavender shade, and Rebel Rebel, which is a deep royal blue shade. I think combination turned out really well. I wanted to really show you guys how I did this, so that anyone who might have these polishes but isn't sure how to use them can try it out. Using my nail art mat, I painted a fairly thick layer of Into The Blue to start because I wanted that to be the anchor color. Next, I went in with two swipes Vincents Stars followed by a sort of zig zag of the French White. Next, I added my top coats. Because I wanted to keep it really blue and add some depth, I started with Rebel Rebel and did two swipes before going in with Purpunk and adding a swipe through Rebel Rebel. There's really no rhyme or reason to how you apply these polishes, I've done swipes like this and I've also done more of a bullseye pattern with drops of polish. The Transforming Top Coat is going to do whatever it's going to do, so how you put down the base is really just preference. What's actually most important is what comes next. Once you have the polish applied to the mat (or to a freezer bag if you don't have a nail art mat), you're going to want to fold and press it onto itself - sort of like those inkblot paintings we all did as children. This will really activate the top coat and help to create more cells and swirls - as you can see in the past picture in the sequence. There will be some cells just from applying the top coats to the regular polishes, but it really gets interesting when you smoosh them. After you've done the smoosh, you'll see it start to change and you're going to want to let it dry for about 45-60 minutes so that you can peel the decal without distorting it too much or tearing it. However, don't let it dry too much because you want it to still be flexible so that you can apply it to the nail without cracking. To apply the decal, I started with a coat of Into The Blue and let it dry completely before following with Yellow Stopper to provide a sticky base. Next, I decided which part of the decal I wanted to apply to my nails and set it on top of the base before gently pressing it down over my nail with my fingertip. I like to follow that with a soft makeup sponge to really make sure everything is adhered and smooth. I give it a minute or two to dry somewhat and then go in with a metal cuticle tool to cut away the excess and then remove it with tweezers. The final step is to use a clean up brush and some acetone to really melt in the edges and make sure everything is clean. This process can take a little bit of practice, but it's actually quite easy once you get the hang of it. To finish this mani, I used a coat of Julep Desiree, which is an extremely fine holographic top coat, and a thick coat of Seche Vive. Annnnnnd now I'm in love. Seriously, I'm not joking when I say I think this might be my favorite nail art I've ever done. I love the depth of the colours and how each nail is cohesive but also completely unique. Clearly, this will have me reaching for my Transforming Top Coats a lot in the near future - and begging Sinful Colors for a re-release with more shades, because this is such an incredible formula! 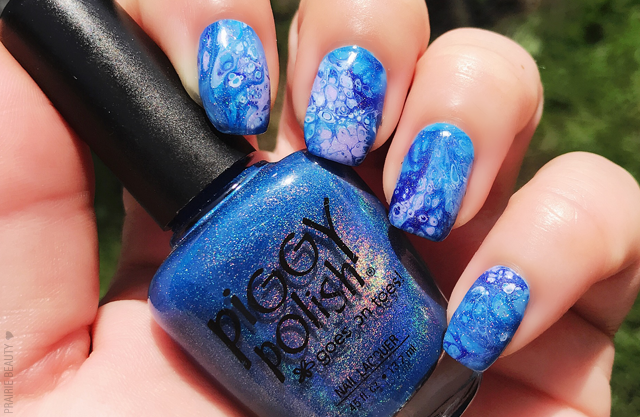 For more Aquatic themed nail art, don't forget to check out Cosmetic Proof and See The World In PINK for their takes on the theme and check back next week for another Mani Monday!